AYANA Lako di’a is a 54-metre phinisi that operates alongside the land-based Ayana Komodo Resort Waecicu Beach, embodying the brand’s signature hospitality in a comfortable and elegant vessel designed to make the most of Komodo National Park’s stunning islands. AYANA Lako di’a operates alongside the land-based Ayana Komodo Resort, embodying the brand’s signature hospitality in a comfortable and elegant vessel designed to make the most of Komodo National Park’s stunning islands. AYANA Lako di’a is well equipped for large groups, accommodating up to 18 guests for overnight adventures, as well as offering ample space for corporate functions, weddings and events for up to 200 guests. AYANA Lako di’a has 9 cabins that are comfortably appointed to accommodate up to 18 guests. The master suite is located on the upper deck and spans 68sqm with a private balcony. 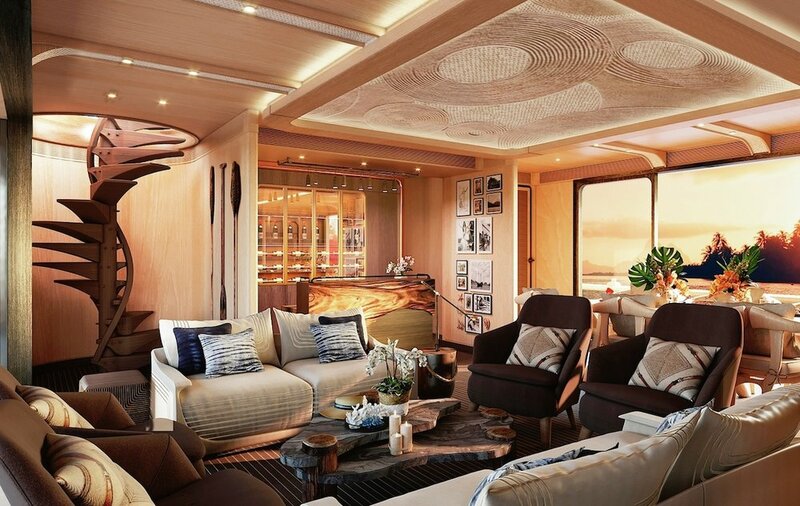 The luxury suites are located on the main deck, with large windows to take in the passing views, while the deluxe suites are situated below deck. All suites feature en suite bathrooms, king-size beds, LED TVs, universal electrical outlets and hairdryers. Embracing understated contemporary Asian aesthetics, AYANA Lako di’a’s interiors blend quality furnishings, refined linens, luxe accessories, and plenty of storage space. The dining room and bar offer comfortable seating for AYANA Lako di’a’s culinary experiences. Guests can also partake in cooking lessons with a focus on Indonesian dishes. AYANA Lako di’a’s onboard spa takes the brand’s approach to wellness and beauty to the sea, with a sanctuary tended to by discreet therapists performing holistic- inspired treatments. AYANA Lako di’a was built in 2018 and spans 54m with a beam of 8.2m and a draft of 3.7. 9 cabins accommodate up to 18 guests. She cruises at a maximum speed of 10 knots.